Beetles, the order Coleoptera, are the largest group of insects. There are 350,000 different species of beetles which have been named: about 40% of all known insects. There are an estimated 800,000 to a million living species. Beetles live almost everywhere, though not in the ocean or in places that are very cold, such as Antarctica. Beetles went through a massive adaptive radiation early in their evolutionary history. The evolution of flowering plants helped drive the diversification of beetles. 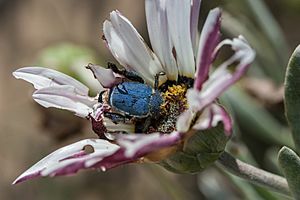 Four of the six biggest families of beetles mainly eat flowering plants. In common with other insects, there are three main parts to a beetle's body: the head, the thorax (the middle part), and the abdomen (the back part). On the head, beetles have antennae (feelers), eyes, and a mouth. 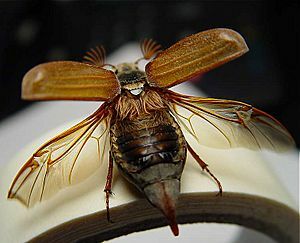 The legs and wings of the beetle are attached to the thorax. The abdomen of a beetle does not usually have special parts on the outside, but it has the beetle’s gut inside. Like other insects, beetles have no internal bones, but instead have a hard exoskeleton on the outside of the body. The exoskeleton is made of hard plates of chitin. The back wings of a beetle are see-through. This beetle uses its back wings to fly. The hard front wings are lifted up. The hard front wings of the beetle hide the back wings. 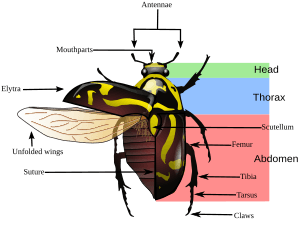 Beetles differ from other flying insects because their front wings have evolved into hard covers, or elytra. The back wings are used for flying. They are thin and are kept under the elytra when at rest. Beetles lift their elytra out of the way in order to fly. A few species of true bugs have a similar arrangement. Not all beetles can fly. Some beetles do not have back wings, and some cannot lift their front wings out of the way. A few beetles have no wings at all and cannot fly. Some beetles with no wings look like larvae, and are called "larviform". An example is the family Phengodidae, glow-worms where the females are larviform throughout their lives. The legs of beetles help them to walk, run, swim, and dig. All beetles have six legs. Each leg is made out of several parts. The parts on the end of each leg are called tarsi. The last tarsus (the singular of tarsi) of each beetle “foot” has one or two claws on the end of it. Most beetles use their legs to walk or run. Some beetle legs are flat and have long hairs on them. These kinds of legs are found on water beetles. Beetles that often dig in soil have flat legs with spines or horns at the edges. Flat legs with horns are called fossorial legs. A few beetles have large hind legs, similar to those of grasshoppers, which help the beetle to jump. Flea beetles are an example of jumping beetle. Beetles have compound eyes, which means the two big shiny eyes on the head are actually made out of many smaller parts. Sometimes the two eyes are each divided in half so that it looks like there are four eyes. One beetle family, the whirligig beetles, has divided eyes so that when they are swimming they can see on top of the water and under the water at the same time. A few beetles have extra simple eyes (usually two) called ocelli. The ocelli are on the top of the beetle’s head. Because beetles have no nose, they use their antennae to smell things. Beetles also use their antennae to feel things around them. Some beetles use their antennae to fight other beetles or even to fight larger animals that want to eat them. Beetle antennae do not all look the same. Some antennae are long and thin, while others are short and wide. Thin antennae are called filiform antennae, and antennae that are wide on the end are called clavate antennae. The mouth of a beetle is very different from the mouth of a person. Most beetles have two hard mandibles at the front of their mouth which are a bit like teeth. Mandibles help the beetle eat by crushing and cutting food. In some beetles, the mandibles look like big pincers. Beetles also have four “fingers” around their mouth that push food into the mouth of the beetle. These fingers are called palpi. Beetles do not breathe; instead they have holes called spiracles in the sides of their bodies which lead to trachea, which act like lungs. Beetles do not have blood, but they have something like blood, called haemolymph. It is a green colour. That's because their haemoglobin molecule has a copper atom at its centre, whereas ours has an iron atom there. Beetles start out as eggs that a female beetle lays. Some beetles can lay thousands of eggs during their lives. A larva comes out when an egg hatches. Most beetle larvae do not look like adult beetles. A beetle larva eats and grows larger until it changes and becomes a pupa. When the pupa opens, an adult beetle, sometimes called an imago, comes out. This way of growing up is called complete metamorphosis. Beetles eat the most when they are larvae. Some beetle larvae eat the outside of plants; some eat inside plants. Some beetle larvae are predators, which means they hunt for other insects to eat. 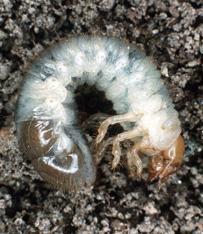 Other beetle larvae eat dead things, such as dead plants and dead animals. Not all beetle larvae look the same. Some beetle larvae are flat and move very fast. To describe these larvae, scientists use the descriptive word campodeiform. Some beetle larvae look similar to hard worms with tiny legs. These have an elateriform shape. Click beetle larvae have a special name: wireworms. Other beetle larvae are short and very thick and are called grubs. In a few beetles, the larvae change their shape after some time. Blister beetle larvae start out moving fast, such as campodeiform larvae, but end up slow and thick. Beetles eat many different things including living plants, rotting plants, animals that may be dead or alive, and animal faeces. Some beetles can eat both plants and animals, while others eat just one type of food. Beetles that can only eat one kind of thing are said to be host specific. Many leaf beetles and longhorn beetles are host specific. Beetles are tough animals for their size. They are mechanically tough (the elytra), and have a variety of strategies to avoid being attacked by predators or parasitoids. These include camouflage, mimicry, toxicity, and active defence. Some beetles live in places that are hard for predators to find. Some beetles, such as longhorn beetles, live in tunnels inside tree branches. Only special predators that are small enough to use the long-horned beetle tunnels can eat the longhorn beetles. Other beetles do not live in special places but they have colours or shapes that make them hard to find. When beetles have colours so that predators cannot see them, this is called camouflage. Some leaf beetles are green so that they can not be seen when they are on green leaves. Some beetles have very complex colours so that they look like bird droppings. Sometimes beetles use colour to warn predators (warning colouration). 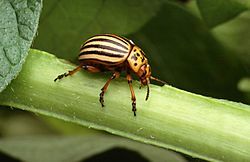 Some beetles have black and yellow stripes so that they look similar to bees and wasps. Some beetles even behave similar to bees to confuse predators. Beetles have a wide range of chemical defences, mostly got from plants their larvae eat. These chemicals make them taste bad when predators eat them. Blister beetles are so poisonous that if a horse eats only a few of them, the horse may die! Bombardier beetles squirt hot poisonous liquid at attackers. Lady beetles put out a cyanide compound when molested. Lady beetles also have colours that warn predators that they taste bad. Insects which taste foul use warning colours which birds learn to avoid. Also, other species which are tasty copy those warning colours. This is a type of mimicry, and is quite common in insects. Very large beetles sometimes fight predators. Beetles that fight will often use their mandibles to injure their predators. Beetles have sexual reproduction, which means males and females mate in order to make offspring. Before reproduction, male beetles sometimes fight to claim a female. This especially happens with stag beetles: males will fight using their long mandibles. Some beetles give special care to their eggs or larvae. 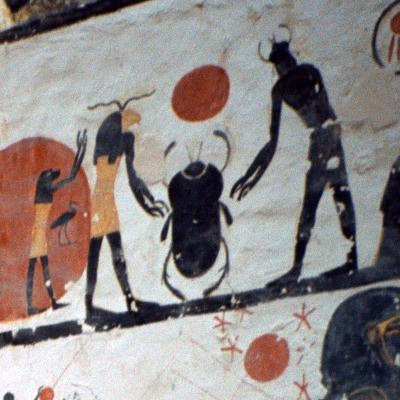 Some scarab beetles, called dung beetles, roll balls of dung (faeces) and put them in a hole in the ground. The female lays her eggs in the dung. When the eggs hatch, the larvae will eat the dung that their mother supplied for them. Adephaga: 40,000 recorded species in 10 families. This is a suborder of specialized beetles, the second largest suborder. Members include ground beetles, tiger beetles, predacious diving beetles, and whirligig beetles. The majority of the species belong to the family of carabids, or ground beetles (Carabidae). Archostemata: Archostemata is the smallest suborder of beetles, consisting of fewer than fifty known species in five families. Archostemata is an ancient lineage with a number of primitive characteristics. They are similar in morphology to the first beetles, which appear in the fossil record approximately 250 million years ago. Myxophaga: Myxophaga is the second smallest suborder of Coleoptera with 65 species of small to minute beetles in four families. The members of this suborder are aquatic and semi-aquatic and feed on algae. Bostrichiformia — including furniture beetles and skin beetles. Cucujiformia — includes lady beetles, longhorn beetles, weevils, checkered beetles and leaf beetles. Scarabaeiformia — includes scarab beetles and stag beetles. Staphyliniformia — includes rove beetles and water scavenger beetles. Rove beetles have short front wings (the red parts in this beetle's back) that do not cover their abdomen. Different kinds of beetles can be divided into groups called families. There are many beetle families. The biggest families are listed here. Ground beetles (family Carabidae) are often black and can be found under rocks. They eat other insects. Leaf beetles (family Chrysomelidae) usually eat on the outside of plants. Longhorn beetles (family Cerambycidae) have very long antennae. Most longhorn beetle larvae eat on the inside of plants. Weevils (family Curculionidae) have long faces that look like the trunk of an elephant. Weevils eat plants. 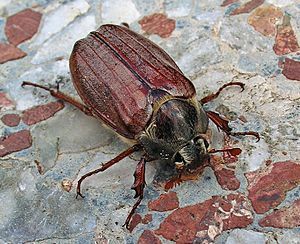 Scarab beetles (family Scarabaeidae) have antennae that are wide on the end. Dung beetles are a group in this family. Other scarabs are very colourful and eat plants. Rove beetles (family Staphylinidae) have short front wings that do not cover their abdomen. Rove beetles eat other insects. Popular names are often misleading; that is why biologists use scientific names in Latin. People call some beetles by other names. Fireflies (also called lightning bugs) are actually beetles; so are ladybirds or ladybugs, which biologists call lady beetles. Some beetles cause trouble for farmers and people in forests because they eat crops or trees. These beetles are called pests. One beetle that hurts crops is the Colorado beetle; another is the Maize weevil. One that destroys trees is the Emerald ash borer. Other beetles help people; lady beetles (also called ladybirds and ladybugs) eat insects that hurt crops and trees. People who study beetles are called coleopterists. Polyphylla fullo has distinctive fan-like antennae, one of several distinct forms for the appendages among beetles. 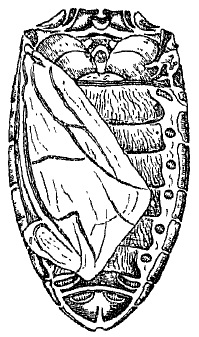 Dytiscus spiracles (right) on upper side of abdomen, normally covered by the elytra, are in contact with an air bubble when the beetle dives. The ivory-marked beetle, Eburia quadrigeminata, may live up to 40 years inside the hardwoods on which the larva feeds. 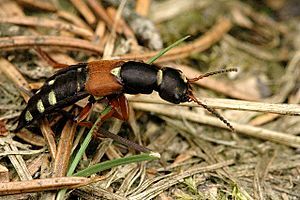 Blister beetles such as Hycleus have brilliant aposematic coloration, warning of their toxicity. The fogstand beetle of the Namib Desert, Stenocara gracilipes is able to survive by collecting water from fog on its back. Titan beetle, Titanus giganteus, a tropical longhorn, is one of the largest and heaviest insects in the world. Scydosella musawasensis, the smallest known beetle: scale bar (right) is 50 μm. Beetle Facts for Kids. Kiddle Encyclopedia.